Retro-inspired action adventure game due out this fall. Nicalis has announced Save me Mr Tako: Tasukete Tako-San, a retro-inspired action adventure game for Switch and PC (Steam). It will launch digitally in the fourth quarter of 2017. 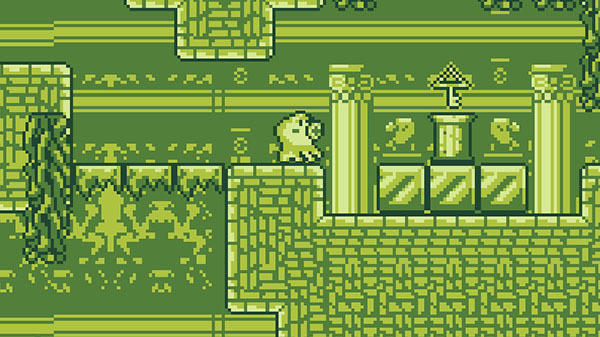 Save me Mr Tako: Tasukete Tako-San was designed by French indie developer Christophe Galati as a heartfelt homage to the many games he loved to play on Nintendo’s original Game Boy handheld console. The game’s color palettes are directly inspired by that hardware’s crude LCD display (allowing no more than four onscreen colors at a time), and the sizes of the character sprites are intentionally limited to 1989 standards. The game’s soundtrack also uses Game Boy-era instrumentation to complete the authentic retro vibe.